It's such fun to sew for the grandkids. I thought I'd share some completed Fall projects. 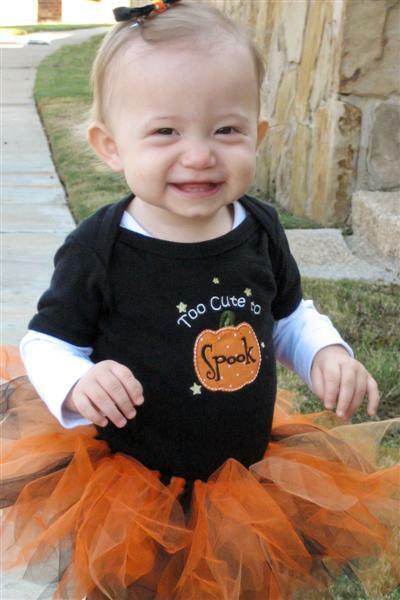 She really IS too cute to spook!! The girls are so proud! They helped Nana at the sewing machine! My boys & their comfy pj's!! This was in a suburban magazine recently & since owls seem to be all the rage, I thought I'd whip some up for the grandkids. I used a box mix and canned frosting, because kids don't care. Here's how you make these adorable cupcakes. Fun for Grandkids to make! Cover the top of the cupcake with chocolate frosting. Twist apart two mini cream-filled sandwich cookies so that you have a cream-covered side & a plain cookie side. Cut each of the plain cookie sides in half. Using a little frosting, attach two of the plain cookie halves, rounded sides in & about 1 1/2 inches apart, on top of the cupcakes. Angle the ears slightly away from each other & allow them to extend about 3/4" beyond the edge of the cupcake. Place two cream-sided cookie halves, cream side up, on the upper half of each cupcake to make the eyes. Use a dot of frosting on the cream of each cookie to attach a chocolate-covered mint (I used M & M's) to the eyes. Press a yellow candy (I again used an M & M) in the middle of each cupcake to make the beak. There you have it...a cute little hoot owl, perfect for Fall!! Source listed in magazine was from Hello Cupcake! Whoo-whoo's my cute little owl helper? More of Nana's cute helpers! 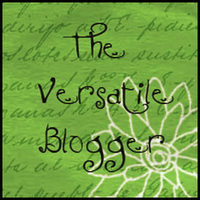 I was honored to receive the Versatile Blogger Award from Suzy at worthingcourt.blogspot.com/. Check out Suzy's wonderful blog for lots of ideas! Thanks, Suzy, for this special award!! The recipient of this award is asked to thank the blogger who bestowed this award upon them and to include a link back to their blog. Then to pass the award onto fifteen other bloggers, include a link to each of their blogs and to reveal seven things about yourself that others may not know. 1. I love to drink a pot of tea every morning. It must be from my Irish ancestors! 2. I graduated from Ohio State University with a Bachelor of Science in Home Economics Education. (I read them in bed, like novels!). 4. I started sewing on my Mom's Singer sewing machine when I was around 7 years old. 5. I love water aerobics & yoga. 6. My husband & I went to Ireland on our dream vacation about two years ago. It was wonderful! 7. I have four grown children & six grandchildren, whom I love dearly. I would like to pass this award onto these wonderful blogs. If you have received this award already, I do apologize! Please check out these wonderful blogs! Oh my, this is SO good!!! I received this recipe years ago from a friend. When I first made it for my family, they loved it! Often now, it's a request for a birthday dinner. It's seems like a long list of ingredients, but the important thing to remember is to have everything cut, mixed & ready to go. It then goes together rather quickly. I don't have a wok any more & do this instead in an electric skillet. After it's finished, I then turn it down to "low" & it can wait until we're ready to eat. I hope you give it a try! Cut chicken into 3/4" cubes. Mix egg white, 1 t. cornstarch, 1 t. soy sauce & the pepper in a bowl; stir in the chicken. Cover & refrigerate for 20 minutes (I often let it sit in the fridge for a few hours.). Cut the green pepper into 3/4" pieces. Cut onion into 8 pieces. Mix the 1 T. cornstarch, the water & 1 T. soy sauce & set this aside to be used later. Heat wok (in my case, an electric skillet) until 1-2 drops of water bubble & skitter when sprinkled in wok. Add 2 T. vegetable oil; rotate wok to coat side. Add chicken to wok & stir-fry until chicken turns white. Remove chicken from wok to a platter. Add onion pieces & gingerroot to work; stir-fry until gingerroot is light brown. Add 2 T. vegetable oil; rotate wok to coat side. Add chicken, green pepper, Hoisin sauce & chili paste; stir-fry 1 minute. Stir in chicken broth; heat to boiling. Stir in cornstarch mixture that you had set aside; cook & stir until thickened, about 20 seconds. Stir in cashews & green onions. NOTE: I keep this on low in the electric skillet until serving time. I serve this over brown rice. Recently I saw this recipe from Sunny Anderson on the Cooking Channel & thought it looked so good. After reading the reviews, I adapted the recipe slightly. Since our sons were coming over to watch the second game in the World Series, I thought this brownie would be the perfect "Red Fever" treat. These are a very fudgy brownie & keep well in the fridge. No matter which team you are rooting for, these will be a hit!! Brownie layer: In a medium saucepan , melt the butter. Remove from the heat & add the sugar, vanilla, cocoa powder, salt & food coloring & vinegar, in that order, mixing between additions. Whisk the eggs in a small bowl and stir it into the cocoa mix. Fold in the flour until lightly combined. Pour the batter into the prepared pan, saving 1/4 cup of the batter for the top. Cream cheese layer: Blend together the cream cheese, sugar, egg & vanilla in a medium bowl. Gently spread the cream cheese layer on top of the brownie batter in the pan. Dollop the remaining brownie batter over the cream cheese layer. Using a skewer or the tip of a knife, drag the tip through the cream cheese mixture to create a swirl pattern. Bake the brownies for 30 minutes. Remove to a cooling rack & allow to cool completely before cutting. Store the remainder in the fridge. I first saw this recipe at Home is Where the Boat is & thought it looked like a fun salad. The recipe actually comes from a Southern Living recipe & can be found here. Of course, I changed it up to use what I had on hand. Use what you have & try this out. Here's how I made this pretty salad for a Fall picnic on our patio. Crumble the cornbread & layer in the bottom of the glass container. Layer the rest of the ingredients on top making a colorful salad. Pour enough dressing on top to coat the salad. Sprinkle with the pepper. The recipe says that you can cover & chill for 3-24 hours. We ended up eating it right away, just shaking the jar with the lid on & then pouring it onto our plates. It does make for a pretty presentation!!! This is a recipe from Great Home Cooking in America by the Food Editors of Farm Journal. My own four children loved this recipe when they were growing up & often would request it for their birthday breakfast. This recipe is great to have a assistant. I love to take turns with our grandchildren in spending the night. This time it was our seven-year-old grandson's turn & he is a great helper in the kitchen & also loves to try new foods!! After playing Old Maids, Crazy Eights, Uno & Go Fish, I told him about German Pancakes & he was my willing helper & taster. Try this recipe out with your helper. I think they'll love it!! I have adapted the original recipe & do it all in a blender. The old recipe used a rotary beater...remember those??!! I don't even own one anymore!!! Oops, we forgot to dust with confectioners sugar!! Combine the eggs & milk in a blender & blend. Add the flour, sugar & salt & blend until smooth. Lightly grease a 10" nonstick skillet with butter & heat for 1-2 minutes. Pour 1/2 c. batter into skillet, tilting skillet back & forth until it coats the bottom evenly. When lightly browned, loosen the edges with a spatula & turn over onto a platter. You will need to butter the skillet each time. Have your helper spread the pancake with butter & then sprinkle with sugar & cinnamon. You also may, instead, spread the pancake with jelly. Roll up the pancake. Dust with confectioners sugar. We also like sliced strawberries in the middle with whipped cream on top! My helper & happy taster!! Yesterday I was awarded the Liebster Blog Award from Anita at Aunt Nubby's Kitchen. I feel so honored to receive this special award & thank Anita from the bottom of my heart!! I always enjoy checking out Anita's recipes & feel that we are true "blogging friends". To my understanding, in German, "Liebster" means "dear" and from the verb "Lieber" means "to love". I do indeed feel truly loved by receiving this award. The purpose of the Liebster Blog Award is to bring attention to blogs with less than 200 followers. 2. Copy and paste the "Liebster" award to your blog. 3. Pay it forward to 5 blogs who you feel deserve this either by email or post to their blog. Please check out these blogs & spread the love!! This delicious recipe comes from Pepperidge Farms. It makes such a beautiful presentation that actually looks like it was bought it from a bakery!! It is so easy, too, which makes it even better. I am one that loves apple desserts, but I must confess, I truly don't like peeling apples. I even have an apple-peeler-corer-slicer, but hate to drag it out. This dessert only calls for 2 apples... even I can handle that!! I hope you give it a try! Heat the oven to 375°F. Beat the egg and water in a small bowl with a fork. Stir the granulated sugar, flour and cinnamon in a medium bowl. Add the apples and raisins and toss to coat. Sprinkle additional flour on the work surface. Unfold the pastry sheet on the work surface. Roll the pastry sheet into a 16 x 12-inch rectangle. With the short side facing you, spoon the apple mixture onto the bottom half of the pastry sheet to within 1 inch of the edge. Roll up like a jelly roll. Place seam-side down onto a baking sheet. Tuck the ends under to seal. Brush the pastry with the egg mixture. Cut several slits in the top of the pastry. After seeing adorable pumpkins on Confessions of a Plate Addict, where she was inspired by Country Living, I had to give them a try. I hadn't used Mod Podge in years, having done numerous projects back in the 1960's-1970's. I was anxious to try it again!! A friend & I got together & we did these cute cheetah print pumpkins. The faux pumpkins were from Michael's and the tissue paper was from Hobby Lobby. Of course, Mod Podge can be found at either of those places. We tore the tissue paper into strips, put Mod Podge on the back & stuck them on. You really need strips to fit onto the pumpkin. After they were all glued on, then a final coat of Mod Podge went over the entire pumpkin. For added embellishment, we added some decorative elements. For a good tutorial, check the above site. I think the cheetah pumpkin turned out pretty cute! Faux pumpkin decked out in cheetah print! I have adapted the original recipe for this meatloaf, which can be found here, to suit our tastes. One of the best things about meatloaf is the leftovers for meatloaf sandwiches, which my dear hubby adores!!!! If you like meatloaf, I hope you give this recipe a try! In a large bowl, combine the beef, & all the rest of the ingredients. Mix well & put in a rimmed baking sheet & form a loaf which is uniform in size. Cover with glaze (recipe follows). Bake for 1 hour or until no longer pink in the middle. Mix together & set aside for glazing the meatloaf. This recipe is from Better Homes and Gardens Golden Treasury of Cooking, which covers favorite recipes from the 1930's-1970's. The recipe was a favorite family while my four kids were growing up. The cookbook states that "Hamburger Pie is the most popular recipe Better Homes and Gardens magazine has ever published." It's quick, easy & filling. Give it a try! In a large skillet, cook the meat & onion until meat is lightly browned & onion is tender. (I drain it at this point). Add salt & pepper. Stir in drained green beans & soup. Pour into a greased 1 1/2 qt. casserole. Mash potatoes while hot; add milk & egg. Season to taste with salt & pepper. Spoon into mounds over casserole. Sprinkle with cheese. Bake at 350 for 25-30 minutes. *Or, prepare 4 servings packaged instant mashed potatoes according to packaged directions, except reserve the milk. Add egg & season to taste with salt & pepper. Add enough reserved milk so potatoes are stiff enough to hold shape. I love watching & learning from America's Test Kitchen. Recently they had an episode about french toast. I've been making french toast for years, but thought I'd try their techniques & recipe. My DIL also had just given me a loaf of her homemade challah bread, which ATK highly recommends for this recipe. If you don't want to use challah, they also recommend Arnold Country Classic White, Pepperidge Farm Farmhouse Hearty White or Thomas' English Muffin Toasting Bread. Enjoy...I sure did!!! Adjust oven rack to middle position and heat oven to 300 degrees. Place bread on wire rack set in rimmed baking sheet. Bake bread until almost dry throughout (center should remain slightly moist), about 16 minutes, flipping slices halfway through cooking. Remove bread from rack and let cool 5 minutes. Return baking sheet with wire rack to oven and reduce temperature to 200 degrees. Whisk milk, yolks, sugar, cinnamon, 2 tablespoons melted butter, salt, and vanilla in large bowl until well blended. Transfer mixture to 13- by 9-inch baking pan. Soak bread in milk mixture until saturated but not falling apart, 20 seconds per side. Using firm slotted spatula, pick up bread slice and allow excess milk mixture to drip off; repeat with remaining slices. Place soaked bread on another baking sheet or platter. Heat ½ tablespoon butter in 12-inch skillet over medium-low heat. When foaming subsides, use slotted spatula to transfer 2 slices soaked bread to skillet and cook until golden brown, 3 to 4 minutes. Flip and continue to cook until second side is golden brown, 3 to 4 minutes longer. (If toast is cooking too quickly, reduce temperature slightly.) Transfer to baking sheet in oven. Wipe out skillet with paper towels. Repeat cooking with remaining bread, 2 pieces at a time, adding ½ tablespoon of butter for each batch. Serve warm, passing maple syrup separately. I am sharing this with Tea Party Tuesday. I saw a picture of these in a neighborhood magazine & thought they looked so cute & perfect for this time of the year. A 4-year-old granddaughter, after taking a bite of one, said "This is the best thing EVER"!!!!! They're so easy to do, too. Make some for your special goblins. Melt some white chocolate bark or melts in a small, microwave safe container. I used a small juice glass. Dip the strawberry in the white chocolate & then place on wax paper to dry. Melt a small amount of semi-sweet chocolate chips in another small, microwave safe container. Using a toothpick, dip it in the chocolate & make eyes & a mouth. Let dry. Serve to your favorite big & little goblins!! YUM!!! !